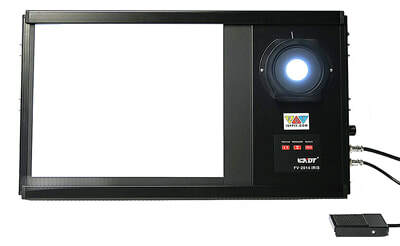 The FV-2014-IRIS is a NEW high intensity LED industrial Film Viewer that combines the features of the proven FV-2014,14"x17" LED Film Viewer with the NEW FV-2018-IRIS, Ultra High Intensity LED Spot Film Viewer. 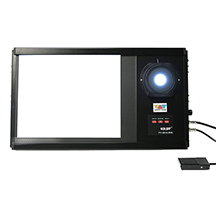 Combining the newest electronic technology and most reliable LED driven circuit, the viewer can operate 24-hours continuously and achieve a 3.9D film on the 14"x17" section and a 4.4D on the ultra-high intensity spot with adjustable iris. Vertical and horizontal illumination of 14"x17" view can be adjusted with the push of a button. Allows for viewing different size film on one viewer without external masking. Quickly switch from 14"x17" to spot by pressing the "IRIS" key. Illuminate both spot and 14"x17" window at the same time. Dimmer control: Adjust the intensity from 5% to 100%. Rugged viewer stand can be adjusted to any angle.